One should furthermore be wary of decorations dispensed by European Union institutions. In 2017 for example the Sakharov Prize, named after Russian physicist Andrei Sakharov, was awarded to the “Democratic Opposition in Venezuela”; the winners here were again proxy associations funded for years by elite US organizations, as even mainstream outlets like the Washington Post reported a month ago. With regard the EU, since its inception in 1993, it has been increasingly influenced by hegemonic American interests, with the USSR no longer in existence to rival this growing power. The EU today consists of 28 nations, a staggering 22 of which are members of NATO: A US-run interventionist military alliance, which has violated international law with its attacks on Yugoslavia, Afghanistan and Libya. One of the principal reasons that NATO was established in 1949, was so as to prevent Europe from pursuing policies contrary to Washington’s plans. As the elapsing decades have shown, it has worked a treat in that regard. Europe has once more been kowtowing to the White House recently, with a list of EU states (most of which belong to NATO) following their master’s wishes by recognizing Juan Guaidó in Venezuela, who is a puppet figure in the truest sense. In 1988 the first to be given the above-mentioned Sakharov Prize was Nelson Mandela, in this case a deserving victor, who was then enduring his 25th year in an apartheid jail. One can assume the South African revolutionary would have been somewhat unimpressed by the same decoration later bestowed upon US-funded groups within Venezuela and Cuba. “We admire the sacrifices of the Cuban people in maintaining their independence and sovereignty in the face of a vicious, imperialist-orchestrated campaign, organized to destroy the impressive gains made in the Cuban Revolution… The most important lesson that you [the Cubans] have for us is that no matter what the odds, no matter what difficulties you have had to struggle under, there can be no surrender. It is a case of freedom or death”. Much to the West’s distaste, Mandela was eternally grateful to Fidel Castro for initiating the liberation of southern Africa from apartheid; with Cuba’s leader sending thousands of his soldiers to the region during the 1970s and 1980s, along with other personnel like doctors and teachers. While Mandela stewed restlessly for long years in a cramped prison cell, those triumphs achieved by Cuban-led armies against the racist, mercenary forces were a source of inspiration to Mandela and his followers – both in jail and spread out on the battlefield. From a psychological viewpoint, the native African troops fighting apartheid had thought their conflict a vain one, for the prevailing mood was that the white divisions were “invincible”. This was due to a deeply ingrained inferiority complex, whose roots could be traced to the white race’s murderous conquest of African lands generations into the past. Similar feelings of despair were witnessed in territories the British Empire subjugated in southern Asia during the 19th century. In Burma (Myanmar) for instance, the British soldier was long considered “unbeatable” by many of the local inhabitants. This perpetual myth of the white man’s invulnerability would rapidly disintegrate, however, with the arrival of the Imperial Japanese Army along Burma’s southern horizons in mid-December 1941. Within a matter of weeks, the Japanese were running amok across the country against Britain’s beleaguered and humiliated infantrymen. In early March 1942, Burma’s capital Rangoon fell, and by late May 1942 the Japanese had expelled Britain’s armies from the whole of Burma, ending more than 100 years of colonial rule. This was no insignificant victory as Burma is a state larger in size than France. Meanwhile, in southern Africa, once Castro’s forces – which partly comprised of black troops – were inflicting heavy defeats upon the racist enemy, it shattered the legend of white superiority in this area, while simultaneously rousing Africa’s freedom fighters. Throughout the 1980s, US president Ronald Reagan was a strong supporter of South Africa’s apartheid dominion, as too was British prime minister Margaret Thatcher. When the tide turned irrevocably against apartheid tyranny in the late 1980s, Thatcher discerned the warning signs and retreated. However, the Reagan administration continued providing assistance to South Africa’s neo-Nazi units, even after they were compelled to retreat southwards. For the meantime, the most prominent anti-government figure in Cuba is currently José Daniel Ferrer, aged 48; in August 2011 he founded the “dissident group” Patriotic Union of Cuba, while his wife is a Ladies in White member. In May 2016, Ferrer described America as “the greatest ally of Cuban democracy”, words apparently spoken in serious tones. In June 2017, Ferrer wrote a letter to US president Donald Trump calling “for a maximum reversal of some policies that only benefit the Castro regime” and he also demanded “strong sanctions on the regime of Raul Castro”. Ferrer is in reality another US-supported proxy candidate seeking to embed himself in Cuban society. He has written of his belief in “the commitment of the European Union and the United States to human rights”, and furthermore expresses his opinion that “the United States, the European Union, and others strive to help Cuba”. Ferrer is an ongoing backer of the Trump cabinet’s malevolent attitude towards Cuba, which ensures daily existence is that bit more difficult for millions of Cubans. Yet Ferrer has spoken of his desire in helping “the oppressed people of Cuba” to achieve “freedom and democracy”, without seemingly realizing the actual oppression can be traced directly to Washington, which continues to implement a punishing six-decade long embargo. There is no call from Ferrer that president Trump should remove this unwarranted blockade, that every country on the planet opposes apart from America and Israel. Nor is there an insistence from Ferrer that US forces relinquish Guantanamo Bay in south-eastern Cuba, which is occupied in breach of international law, and where some of the most severe torture has taken place in the Western hemisphere. Also receiving no mention by Ferrer are the decades of US-directed attacks on Cuba, aid for international terrorists, bombing of Cuban hotels, etc. In recent years, Ferrer has toured cities across Europe and America – which he titles “the free world” – visiting Miami too, the region from which many brutal anti-Castro schemes were instigated. Ferrer has called for other like-minded souls to join protest cliques in Cuba, including of course the Ladies In White. He held meetings with the top US diplomat in Cuba, Jeffrey DeLaurentis, before the ambassador left his post in July 2017. Perhaps unsurprisingly, Ferrer has mass media backing with the Washington Post describing him in May 2016 as, “A tall charismatic man, with a deep voice” who is “a new breed of Cuban dissident”. The New York Times labels him as “a fiery lieutenant” in the opposition “movement”. 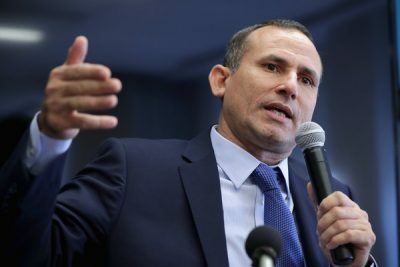 The Miami Herald championed Ferrer in August 2018 as “the leader of the largest dissident organization in Cuba”, and who is “a clearly charismatic leader”. This is the same newspaper which described Luis Posada Carriles, one of the world’s biggest international terrorists, as “the Cuban exile militant and CIA operative who targeted Fidel Castro’s rule”. Such was the Miami Herald’s portrayal of Posada upon his death last May. Remarkably, all of these actualities seem to be lost on both Human Rights Watch (HRW) and Amnesty International, whose reports relating to Cuba are also lacking in historical perspective and context. The NGOs’ accounts are, in fact, mostly diatribes which have performed a key role in fostering a negative image of the Cuban nation. Due to Amnesty and HRW’s respected reputations, well meaning people who read their analysis on Cuba are unduly influenced by their skewed studies, and so a grossly unfair identity of the island country is promulgated. Western elites must be grateful indeed to the NGOs for their work in this case. In August 2018, Amnesty insisted that Ferrer is a “pro-democracy leader” and “a prisoner of conscience”; these are descriptions the London-based NGO have conferred upon Ferrer for a number of years now. Previously, in March 2013, Amnesty stated that Ferrer was leading “an unrecognized organization that seeks democratic change by non-violent means”. In HRW’s 2019 review, they simply describe Ferrer as a “dissident” and have been highlighting his cause for successive years. Considering Ferrer’s flagrant anti-government campaigns in Cuba, it is hardly surprising that he has spent periods in jail, along with other US surrogate figures. One should put into proper setting the enormous extent of threat facing Cuba’s government and its population: The country is in opposition to the most powerful state in history, whose military might dwarfs even that of China and Russia. American governments have intervened, directly and covertly, in numerous sovereign countries since the early 1950s. Scarcely any of this receives mention in the NGOs’ reports concerning Cuba. The overall situation is surely not lost on the Cubans themselves. To have any chance of surviving from its outset, Castro’s government realized that it had to swiftly repel proxy organizations within the state, so as to prevent Washington from establishing a possible bridgehead. In the great majority of cases modest prison sentences were handed out to the accused, some of which were then commuted, with many detainees thereafter departing towards Miami.